School. P. & J. went to Brian’s sports in afternoon so I wrote letters until 6.30 when Hugh phoned me. I had a lovely letter from him today. I wrote stories till bed. The two stories Enid wrote were 'Puss in Boots' and 'Jack and the Beanstalk', 3,500 words in all. Re-tellings of old English stories. School. I wrote letters etc all afternoon & evening. Hugh phoned at 6. School. Met Phil at Waterloo at 2.45 & we went & had tea at Lyons Pop & talked. We had a lovely talk. I met Hugh at 6.5 & we went for walk in Temple Gardens & then to Rules to dinner. Hugh was rather chilly till I began to feel tired & then he was a darling. He took me right home to Southernhay. Rather than meeting at Lyon's Corner House for tea, as usual, Enid and Phil met at Lyon's Popular Cafe on Piccadilly. A much bigger establishment, with seating for 2000. I wonder if Enid took the opportunity to talk to Phil about the work she was doing for Nelson's. After all, she was the illustrator for one of the batch of six that Enid was in the middle of writing, the one concerning Enid's own stories, Pinkity's Pranks. The other books were re-tellings of other people's stories. The Aesop and Brer Rabbit books were already written, and now so was the one of old English fairy stories. Phil: "You'll be re-writing Gulliver's Travels next." Enid: "Well, that is on the list of 36 titles, though I'm just focussing on the first batch of six for the moment." Enid and Hugh walked in Temple Gardens. 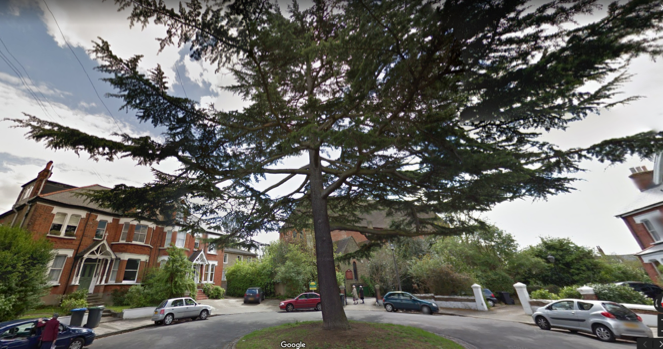 Previous mention of 'gardens' had been at the Embankment, but from now on the couple seem to have preferred to stroll in the gardens associated with the HQ of the legal profession. In 1924, walking down a narrow alley from Fleet Street into the Temple would have given a real sense of passing from Medieval London to Eighteenth Century London, still pleasantly free of vehicles. The grand terrace houses, now barristers' chambers, have an eighteenth century character. The garden spaces are managed like eighteenth century garden squares and these are likely to have appealed to Enid, given the layout of the garden she eventually designed at Green Hedges. School. Hugh phoned at 11 to say that rings were ready. Then at 1pm to say Gpa had been making inquiries about him & found out what we had been keeping secret for a while & sent Uncle Ralph to see him! I met Hugh at 5.45 & we got our lovely signet rings but mine’s too large. We had tea at [?] Tea Rooms & dinner at Victoria. Hugh came right home with me & we gave each other our rings at the lamppost in Perth Rd! 'Gpa' is Grandfather Attenborough, the patriarch of 34 Oakwood Avenue. He'd found out about Hugh's first marriage and enquiries were being made of Hugh by 'Uncle Ralph' Thompson, a solicitor and Attenborough brother-in-law. Lamppost in Perth Road? Well, here is a 1924 map of the part of Beckenham where Enid lived. 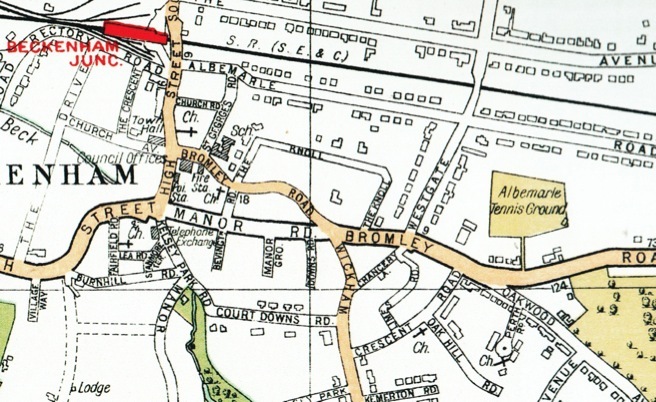 Perth Road leads into Oakwood Avenue shortly below the junction of Oakwood Avenue and Bromley Road, and could have been on Enid and Hugh's route to number 34 (bottom right corner of map) from Beckenham Junction Station (top left corner). Not sure where the lamp post would have been, but the nicest thing about Perth Road now - and probably then - was St Barnabas Church. There is a lamp post in its vicinity (behind the blue car near the centre of the pic). There is also a grand tree. Met Hugh at 10 & we went & saw Uncle Ralph at 11.30 & things are quite straight. We decided not to go to the [?] & I was glad because I was tired. We went & had lunch at our usual place. 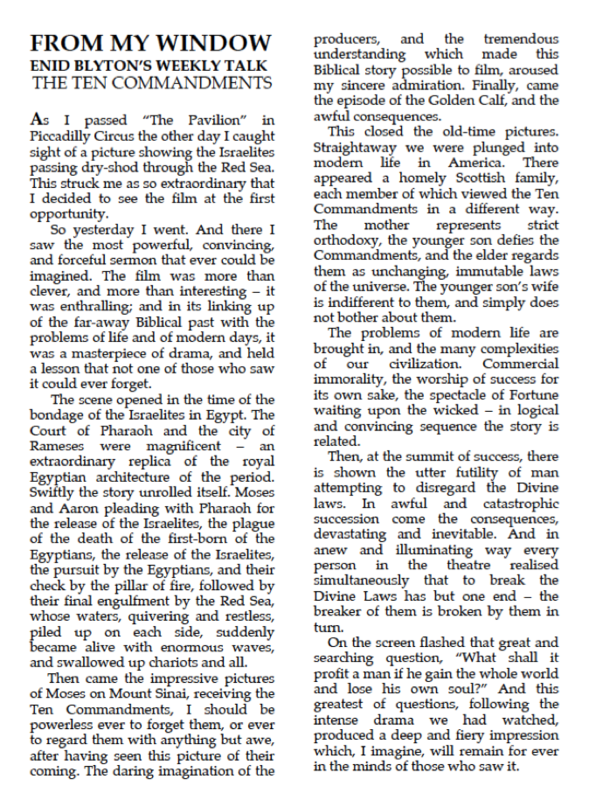 Then to see the Ten Commandments at the Pavilion & it was simply glorious. Tea at Corner House & talked. Then dinner at Victoria. Hugh came down with me & we had the carriage to ourselves, it was lovely. Wrote all a.m. Met Hugh at 2.30 at Holborn & we went to the zoo. We saw a wonderful, wonderful peacock that kept spreading its tail for us to see. Tea at Corner House & dinner at Victoria, where Hugh saw me off. He was such a dear all day & so lovely. Enid doesn't mention that she was sitting beside her husband-to-be while watching the film. There's a couple of patterns here that need to be pointed out. Three of the last four Talks have been about experiences shared with Hugh. They seem to have replaced the kind of Talk where Enid shares an experience with children and writes of that (as she did in "Only Just Us" at the "Windmill Man" and 'Candid Letters'). One would imagine this pattern would become more pronounced given what happened next. To Surbiton for the last time early on Monday a.m.! School. Went out & bought books for children & vase for A.G. Home at 6. Hugh phoned me & told me that he’d heard definitely that the case would be heard at Easter & so he’d be free in June. I am so very glad. Wrote letters till bed. With Enid and Hugh's impending marriage, clearly it had been decided that Enid would give up her teaching. Indeed, she would have no choice but to do so as in March 1923, London County Council had decreed that teachers should be included in the Marriage Bar that had applied to other professions since 1906. Although this seems from a 21st Century perspective to have been grossly unfair to women, it may not have been so bad for Enid who had always intended to be a writer. Those years teaching children had already taught her what children looked for in stories. Now she was going to take on board the task of educating a mass audience of children through her pen. However, I imagine that if the law had been different, Enid would have carried on as a teacher. And only as her writing career took off would she have considered giving up a job she so obviously enjoyed. School. Wrote letters & cleared up things generally till tea. Met Hugh at 6 & he gave me some lovely daffs. & brought me my ring which has been made smaller. We had a lovely evening alone & Hugh didn’t leave till ¼ to 12! School. Packed up all afternoon & evening. Hugh phoned at 6 & was very sweet. He didn’t get home till 1.30 last night! We broke up this morning, for the last time. The kids were very sweet. A.G. & U.H. gave me a lovely copper jug & Larry [?] & the boys gave me a pewter vase. I left at 2.30 & met Phil at 3.30 & we talked & had tea. Met Hugh at 6 & we went to Corner House & talked till 7. Then I went home. [?] till bed. Lovely letter from Nelsons. Did Enid turn around at take a last look at Sourhernhay? Where Enid had worked for four years, learning what made children tick. Knowledge that she would put into effect for the rest of her writing life. If she had any regrets, all she would have had to do would have been to read the letter from Nelson's who were no doubt impressed with Enid's Brer Rabbit stories, her versions of Aesop's Fables and her Prinkity's Pranks. And now she was giving herself more time to complete the huge educational and literary task she had set herself. A sensible move. Went out and bought zoo books. Peggy spent the day. I read books till lunch. Hugh phoned at 1. J.B.R. phoned at 3.30 & asked me to go to tea. I met Hugh at 6.15 & we went to the Chandos Grill & had dinner. I told him what the doctor said about me & he was sweet about it. He dictated a letter to be sent to J.B.R. He came down to Beckenham with me. The fact that Enid 'went out and bought zoo books' the day after she left her teaching job emphasises that she was making the most of having no option but to become a full-time writer, with no need for a transition period. Met Hugh at 10 & we went & had coffee at Hills. I went over his story with him. Then we rode on the top of a bus & when it began to rain we came into town again by underground & had lunch at the Popular. Then to the pictures & I loved it. Then tea at Lyons Popular then dinner at Victoria. Hugh was a darling all day & it was a lovely Saturday. Lyons Popular on Piccadilly seems to have been flavour of the month. The bus excursion would be the subject of a Talk. Wrote all am. Met Hugh at B.J. at 2.35 & we sat on the verandah & Hugh told me about Africa. Then tea, & church but we came out ½ time for the singing was awful. Hugh was very sweet & lovely. He left at 10.15. B.J. is Beckenham Junction. Enid wrote two of her From My Window' pieces this Sunday because she knew she was going to be out of London the following weekend. “Going to pour in a minute. as he gave Hugh our tickets. 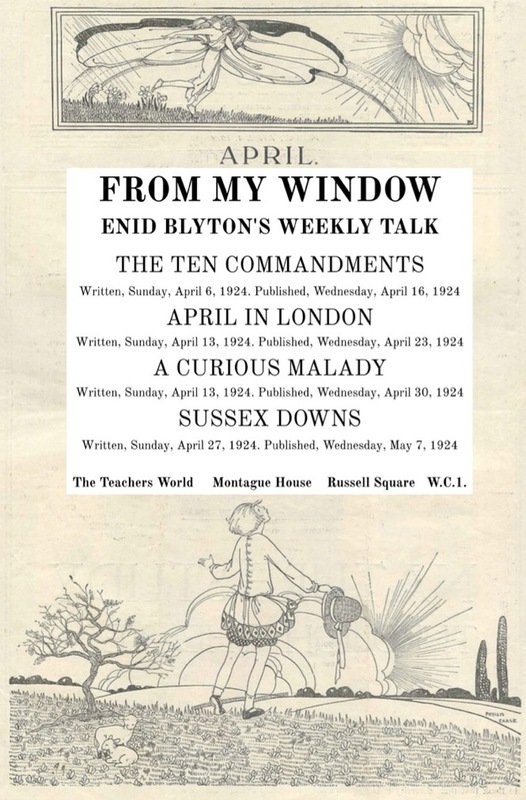 As with March, for two weeks in a row, Enid has had an experience with Hugh on a Saturday, then written about it on the Sunday. 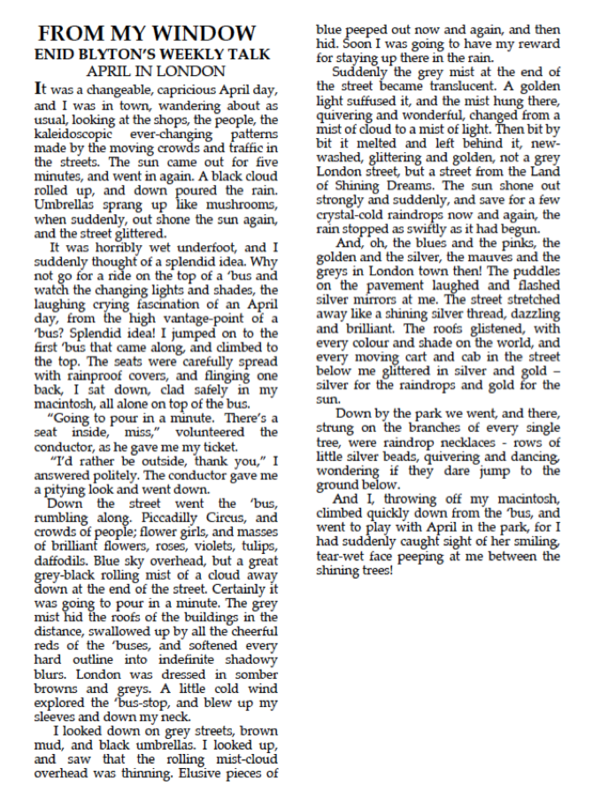 In April’s case the experiences were going to see a new film, The Ten Commandments, and taking a ride on a London bus, open to the elements. So, just as in March with its all-day walk on the Downs and the visit to the Ideal Homes Exhibition at Wembley, one event was outdoors and one indoors, one cultural and the other an encounter with nature. I wonder if Enid was conscious of these patterns and was minded to vary things a bit. In any case, I dare say Enid treated herself to a cup of tea, before settling down to write her second Talk of that Sunday. Which she would have been doing only because she knew that she was going to be away the following weekend. She might not get a chance to sit down and concentrate the way she could at home. So what’s it to be, Enid? An essay in a different register? Something a bit more abstract? This Talk is a reminder that there is a second major pattern going on. As well as recording her weekends with Hugh, Enid is taking us through the seasons, in time with Mother Nature. First, standing in her garden in January (Hoar-Frost and The Wild Garden). Then waiting for the flowers in February (‘Spring Flowers’). Next experiencing the power of the wind in March. But the immediate precursor of ‘A Curious Malady’ is ‘Magic’. In that Talk, spring was first signalled by the sight of caterpillars turning into moths. By the middle of April, all of nature was on the move, including Enid herself. Interestingly, Enid was set off by a brimstone butterfly, hooking up her 'Malady' to the 'Magic' she’d already discussed. Wrote all day till 4.30 on the specimen chapter for zoo book. Copied out 2 T.W. talks. Hugh phoned twice & then again at 10.15 because we nearly quarrelled at 6 & he couldn’t bear it. Enid's log book reveals that the specimen chapter was chapter 8 (so the book was planned before it was written) concerning 'Cats great and small'. Did Enid finish it on the Monday? She may well have done as she wrote 3,500 words and she doesn't mention returning to the Zoo Book until after Easter. Went to Phil’s. Got there 10.30 & we talked till lunch. She & Felix are always having rows. Something will happen soon if they don’t look out. We went shopping in afternoon & I bought a dear little jumper suit. Had tea, and afterwards I met Hugh. We went to Chandos Grill Room & quarrelled. Then to Corner House & made it up! He came home with me. He is a darling boy. Enid would be recalling the rows that went on between her parents in the months before they split up. That is the first mention of the Chandos Grill Room which, after Easter, takes over from Rules as their favourite place to eat in London. To Bromley & shopped. Got a sweet hat. Wrote to Hugh till tea. Packed with Mums till dinner. Read, sewed & listened till bed. Hugh phoned at 6.15 & was a darling to me. Mums went to Seaford by car with O. Herbert at 9.30. I took Granny out & shopped. Had hair done. Up to town in afternoon & met Hugh at 5 & we went down to Seaford together. Had dinner at Eversley where Mums, Hugh & I are staying. Hugh & I went out along the front in the moonlight & sat on beach till 10. It’s lovely being away with Hugh! A holiday with Hugh. But with Mabel along as chaperone because they're not married yet. Seaford is a quiet seaside resort in East Sussex, on the south coast of England and at the foot of the South Downs. We lay on beach with Mums all a.m. & weather was glorious. The sea was calm. In afternoon Hugh & I went on beach alone then went back and joined Mums at tea at Eversley. We went for a walk to Hope Gap afterwards, & sat on the downs & Hugh was a darling lover. Played bridge & pelman till bed. It was such fun. It has been a wonderful, wonderful day. Hope Gap is a gap between cliff downs where it's possible to walk along the beach. On beach alone with Hugh all a.m. & afternoon. Another walk after tea up on the downs near the Golf Links. It was heavenly by ourselves. But Hugh didn’t like something I said about nightingales on the way home & nearly spoilt things. Before we had finished dinner he rushed out & came back whilst we were having coffee in the lounge and gave me a big box of chocolates. He looked such a dear. We played pelman again & Hugh won. He is very good at it. We stayed behind in the lounge after the others had gone to bed. It is so lovely living in the same house as Hugh. Hugh didn't like something Enid said about nightingales! Don't tell me Enid's high spirits and bird metaphors are lost on the person she was going to marry. But then I don't think they were lost on him. Went out in a boat with Hugh. It was a glorious day with blue sea, blue sky & Hugh’s eyes were as blue as the water. He rowed to Newhaven & back & I rowed a bit too. It was heavenly. We sat on beach till lunch & again afterwards. We went for walk to Hindover with Mums afterwards & I was a hare & ran away but Hugh caught me after a mile. We went out after dinner & sat on a [?] on the beach. It has been a lovely magic day. No writing done this week. Not that it matters, because Enid knew she was going on holiday and had written those two From My Windows the previous Sunday. Ah, what it is to be organised and efficient (as well as inspired and brilliant). Beastly letter from Gpa, but otherwise a lovely day. We were on beach in the sun till tea & went for a walk on the downs till dinner. We played pelman till bed & Hugh won. We stayed by ourselves in the lounge till 11.56 & the hotel people played a joke on us! It has been the loveliest Easter that ever was. What has Grandpa Attenborough said to upset Enid? He wasn't allowing her to have a key to 34 Oakwood Avenue. What?! 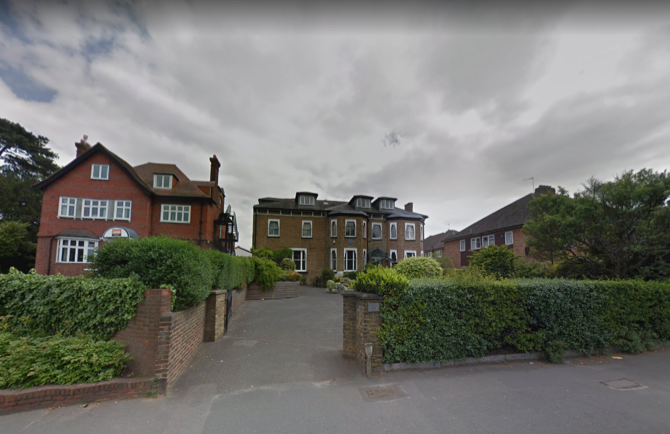 It seems that for four years, at weekends and during holidays, Enid had been living in some kind of guest room at 34 Oakwood Avenue without a key to the house! And now that it was about to become her sole address she still wasn't going to have her own key. A double-whammy from the patriarchy in April, 1924, then. First, having to give up her job because a woman teacher wasn't allowed to marry. Second, not being allowed to have a key to the house she lived in. We'll come back to this later in the week. Saw Hugh off at 8.33 & oh the rest of the day without him was beastly. I missed him so dreadfully. On beach all a.m. & wrote African poem. Wrote to Hugh on beach all afternoon. Got him some gingerbread biscuits & sent off after tea. Wrote till bed. I have missed him so. It’s BEASTLY. On beach till 12.45, writing to Hugh. We motored home in U. Herbert’s car with Joan at 2.20 & got to Joan’s for tea at 4.30. Home at 6. Hugh phoned for an hour at 6.15! He sounded such a dear. I unpacked & put my things into the little room I’m going to have now. Mums had a talk with Gpa & he’s climbed down & I can have a latchkey! So Mabel's intervention put the key business right straight away. But the Marriage Bar on teachers was only lifted in 1935 after years of lobbying by the National Union of Women Teachers. Moved my things from spare room to the little room I’m going to have. Met Phil at 3 & we went to Corner House & had tea & talked about our Easters. I met Hugh at 6 & we went in the Gardens & then to Chandos Grill Room for dinner. We drew up an advertisement for a flat in August! It was such fun. Mabel had a talk with Granpa last night about being so absurdly stupid to me & he’s promised to behave better! Good for Mabel. It must have been hard for Enid, Mums and Phil, living in a world that was even more a man's world that the one we live in today. Phil: "Tell me about the South Downs." Enid: "We left our ship a-recking there, and off we trekked for days. Exploring and adventuring down sunny golden ways. And saw gold-miners working as we trekked across the land." Phil: "Don't stop, Enid, tell me more." Enid: "We stayed at old Dutch houses, where the folk were kindly-eyed. We heard again the story of old Captain Van Riebeck. And in my dreams I sailed with him and trod a gleaming deck." Phil: "Let me get this straight. Hugh just has to ramble on about a country once, and you come up with this!" Where rolling plains and distant hills were washed with magic blue. Where springbok, shy and graceful, fled away and hid from sight. And where the Southern Cross was swung above us every night." Phil: "You are such a star!" Enid (sighing): "I’m in love." Wrote all a.m. & afternoon. Listened in till 6.10 when Hugh phoned & was a dear old darling tonight. I do love when he sounds loving. I sorted out various things all evening & then read Punch & listened to dance music on wireless. Enid settled into her room of her own and got down to work. I mean she really did. She had Nelson's Reader 4 to write, The Book of Silly People', and it took her two days. On the Friday, she wrote the five stories making up 'The Wise Men of Gotham' and two of the four stories making up 'Three Foolish People'. Just over 6000 words in all. Met Hugh at 9.35 & we went to Kew but it poured with rain & all we could do was to sit on a bench & talk till it was time to eat sandwiches! But it didn’t matter. Hugh would keep kissing me when people came by. We trained back at 1.35 but got into wrong train & went to Hampstead Heath! Got back to town at last & went to paradise Corner to see the pictures till 4.30. Then I saw Hugh off at Victoria to spend the weekend with his cousins. Home at 6. Slept till 7! Played bridge & listed in till bed. No time to write any more of The Book of Silly People. Too busy being kissed by Hugh. The silliest person of all. Wrote all a.m. & till 3. Finished 1st 6 of Nelson’s books. Wrote to Hugh till tea. Didn’t go to Chapel. Read & listened in till bed. I HATE Sundays without Hugh. Yes I do. I think she must be counting the poetry book, Silver and Gold, as one of the six Nelson books, even though it's not a Reader as such. 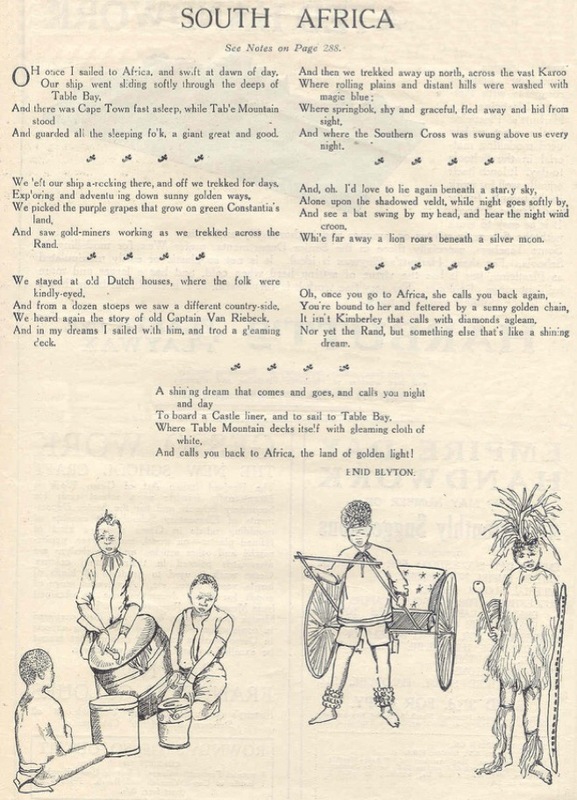 To finish off Nelson Reader 4 (Nelson Reader 5 being the Old English Stories Retold, which had been finished on April 1) she wrote two more stories towards 'Three Foolish People' as well as 'Fairy Wishes' and 'Lucky John'. But despite writing 4,510 words in order to complete The Book of Silly People, Enid didn't have a good day. She HATED Sundays without Hugh. Yes she did. 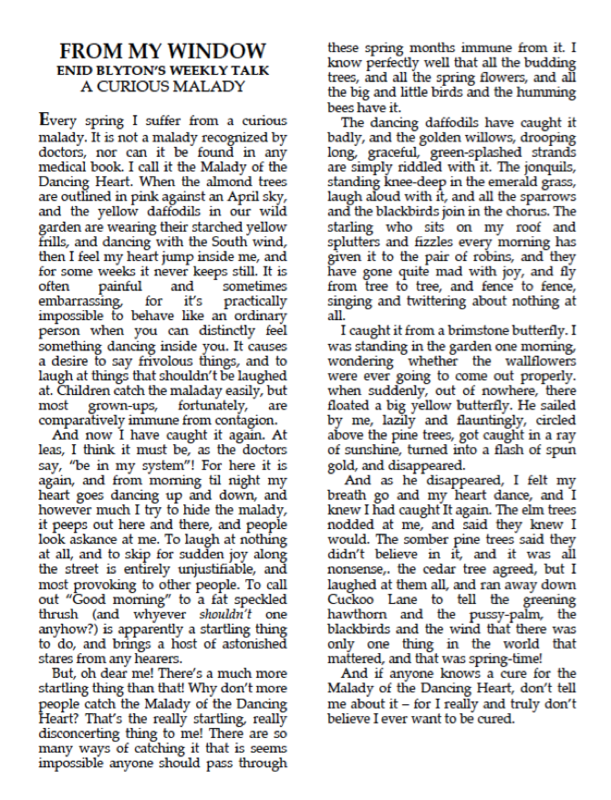 Anyway, to keep her spirits up, or for some other reason, she added a Talk to her day's output, the first she'd written since the double-header of a fortnight before. That’s an original final image, to link the lark’s song with a rabbit’s ears! Traditional thinking suggests that rabbits have large sensitive ears to listen out for danger. Brer Rabbit and Brer Fox. But, no! The big ears are for hearing larks songs, however high in the heavens they’re being sung! I think Enid is right - that Talk should be rendered in poetry. So here goes - take it away, Enid Blyton! While far away a rabbit sniffs beneath a silver moon. Nor yet Hope Gap, but something else that’s like a shining dream. And calls you back to Sussex, the land of golden light!" Collected & pasted in a book the poems for Nelson’s Reading Book of Poetry. Took me all a.m. & afternoon. Got a lovely expressed letter from Hugh at 4.30. Wrote to him after tea. He phoned at 6. Played bridge & listened in till bed. Had letter from a Mr Perry saying Cassells had recommended me to them. I called as requested at 10 & he gave me the job of writing a fairy booklet for advertisement purposes. I looked at shops etc till one & then met Hugh & we had lunch together at Chandos Grill Room. He was very sweet. I am awfully pleased because he’s got his 1st article published today in the Mail. I got home at 4.15. Peggy & A. Maud were here. Hugh phoned at 6. Listened in & bridge till bed. 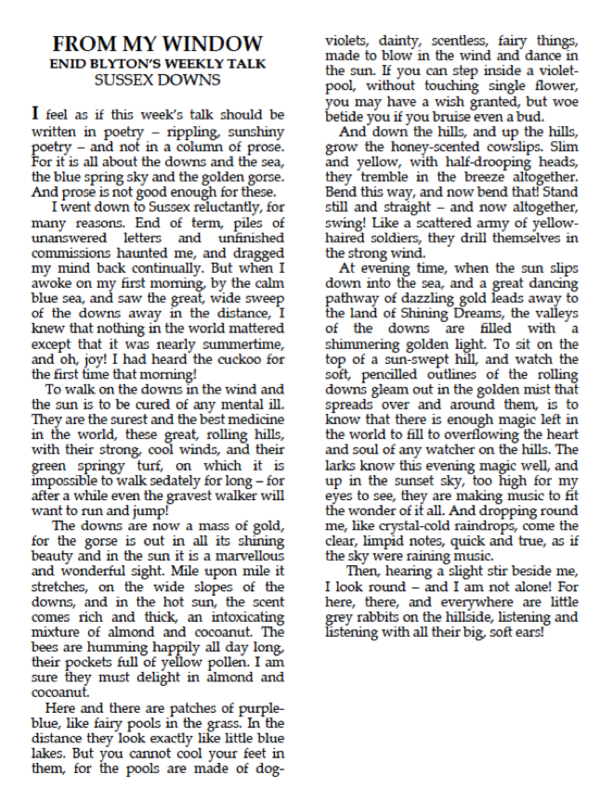 Now I would love to know what Hugh had written in the Daily Mail on April 29, 1924. But to get access to the mail Archive one needs access to a library that takes out a subscription to Gales. And I don't think there is such a library in Scotland. But why don't I ask the British Library? Maybe they would provide a copy. What good service! 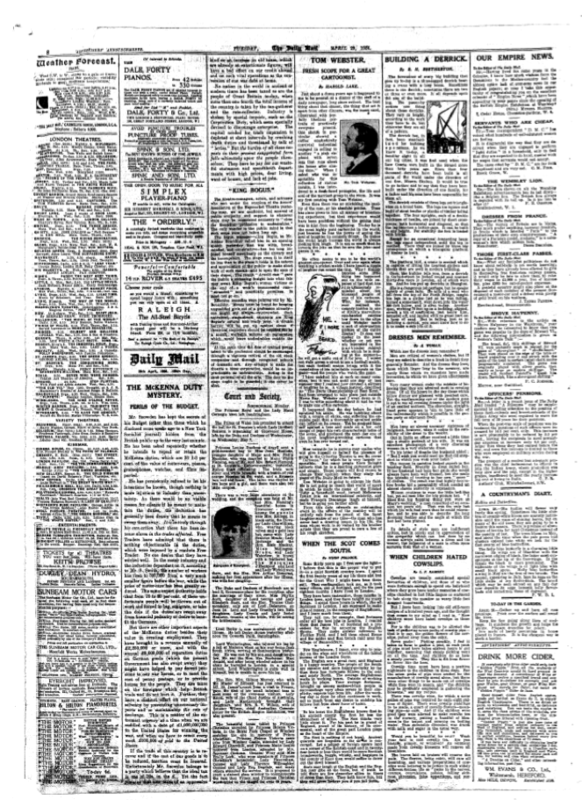 This is page 7 of the Daily Mail, which was a broadsheet in those days. Hugh's piece is at the foot of the fourth column, called 'WHEN THE SCOT COMES SOUTH'. That feels dated to me. 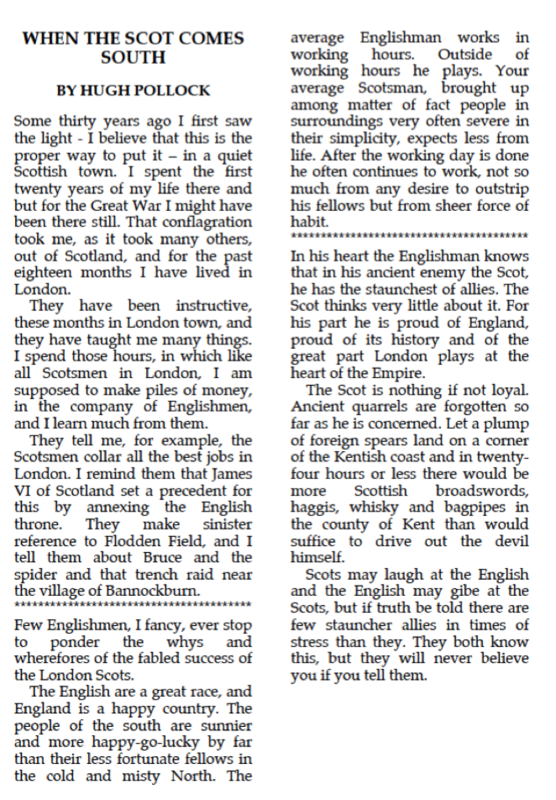 For a start, Hugh pens an all-male scenario - Scotsmen and Englishmen - with no place for women, not even his girlfriend. It's also full of spurious distinctions. X laughing at Y; Y jibing at X. X knowing Y are loyal; Y thinking very little about it. Yea, Hugh - read them and weep. That's where your jealousy should really lie. Wrote all a.m. Met Phil at 2.40 & went to Comer House in Piccadilly. Pouring wet day. Had a lovely long talk. Met Hugh at 6.15 & he came down to Beckenham to dinner. He was a perfect darling & I love him. Phil: "What's all this about haggis and broadswords? Enid: "Apparently it's what the editor of the Mail wanted." Enid: "And we mustn't giggle. The fact is, Hugh is a perfect darling and I love him. Phil: "Do I hear wedding bells?"